Many parents believe that each child in the family needs to have their own bedroom. The kids can express themselves in their own space, have some alone time, and take responsibility for their own belongings. But who’s to say this can’t be achieved in a shared room, too? Siblings who share a bedroom build communication skills, learn how to problem solve, and start to understand the importance of respecting others. Sure, this doesn’t come without its fights over who stole whose pillow, or which child created the mess that they’ve both been asked to clean up. While we can’t stop those arguments, we can share creative tips on how to decorate and organize your kids’ shared room in a way that makes them both happy. Your teacher for the day: MakeSpace, a super convenient alternative to self-storage units in Los Angeles, Chicago, NYC, and DC. They pick up, store, and deliver your stuff so you never have to visit a storage unit and have more time to spend with your kids. Providing each child with an area to call their own can keep arguments at bay while allowing them to put their personalities on display. Sara of Simplify by Sara separated the room shared by her 12-year-old daughter and 5-year-old son in a way that worked for both kids while keeping the whole room clutter-free. 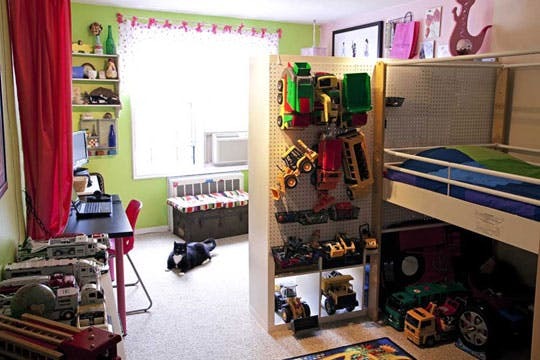 Shelving on her daughter’s side of the room displays movies and collectibles, and a pegboard on the reverse side of the shelf stores her son’s toy trucks. Let each kid show their personality with bedding in their favorite colors or that features their favorite characters. Then, choose accessories to be arranged around the space that will tie everything together. 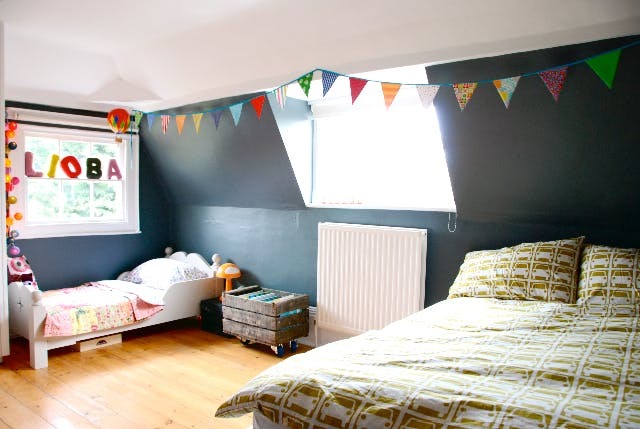 This fun room shared by kids aged 4 and 2 includes two entirely different bed sets. Everything comes together with a bright pennant garland, colorful vintage artwork, creative storage, and a subdued yet impactful backdrop of dark walls. Dark walls that can easily be cleaned thanks to this wonderful wall-wiping guide from Friendly Windows. The result is a cohesive space that still affords the kids some individuality. It’s just the right amount of crazy fun, which is exactly what childhood should be, don’t you think? Open shelving alleviates the need to keep everything in a specific space, which is a blessing in a room overflowing with multiple kids’ belongings. 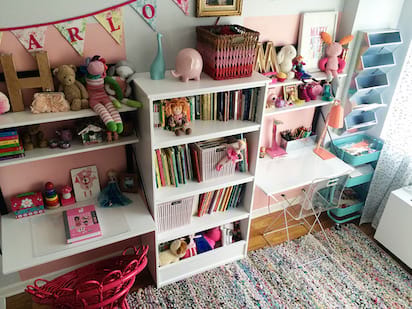 Embrace organized chaos and give each child free reign over their own set of shelves. They can exhibit their favorite books, stuffed animals, knick-knacks, and whatever else they deem worthy of showing off. Multiple kids in one room leaves little space for anything else, especially a dresser. 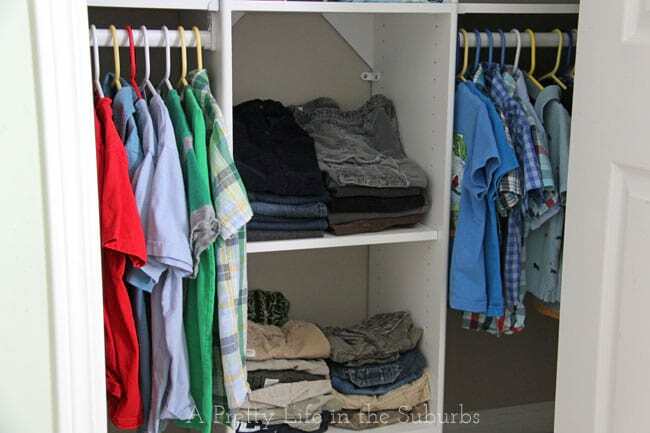 That’s why Jo-Anna from A Pretty Life in the Suburbs created a closet organizer for her two boys using hanging racks and shelves. Their clothing is separated to make getting ready easy, and the straightforward organization simplifies the cleanup process at the end of the day. Gone are the days of dividing a room down the middle with masking tape to declare which side belongs to whom. With monograms, name plates, and statement-making initial artwork, there’s zero confusion about who owns which area. In Mommy Shorts’ bedroom for two growing girls, each desk is adorned with the initials and special belongings of each kid. Personalized pillows were also added to each bed to give them an individual touch. It’s clear who reigns over which area without distracting from the overall feel of the room. Hand-me-downs are crucial for saving money with multiple children in the house. It’d be great if siblings could sync their growth spurts so one could take over a T-shirt as soon as the first one was done with it, but there are bound to be lulls in the rotation. 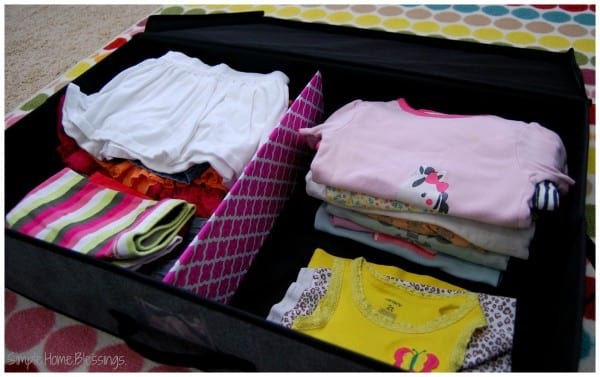 Until Sibling #2 can fit into #1’s clothes, store these items in boxes and bins that are out of the way yet readily accessible. High closet shelves and under the bed are both valuable spaces that are prime storage for rarely-used items. When #2 is ready to grow into an update, you’ll know exactly where to “shop” first. separate spaces — without ever putting up a wall. Visually splitting the area in two with wallpaper, artwork, or decorations that are in stark contrast to one another gives the illusion that there are two totally distinct rooms, minus a call to a contractor.